The elderly Asian woman stood by the nurses’ station, tapping her fingers on the counter in time to music playing on her iPod. That’s interesting, thought Head Nurse Milana Leviyev. Curious about what the resident with dementia might be trying to communicate, Leviyev found a portable piano keyboard and placed it before her. To everyone’s astonishment, the resident began to play. Leviyev brought her and the keyboard into a community room, and this elderly Asian woman, who didn’t speak a word of English and had never before indicated to anyone at Goldwater Specialty Hospital & Nursing Facility that she was a musician, commenced playing for her fellow residents. The tune was How Much Is That Doggie in the Window? Everyone sang along. “We have so many stories like that,” says Margaret Rivers, Associate Director for Patient Services at Coler-Carter Specialty Hospital & Nursing Facility (formerly Coler-Goldwater) in New York City. 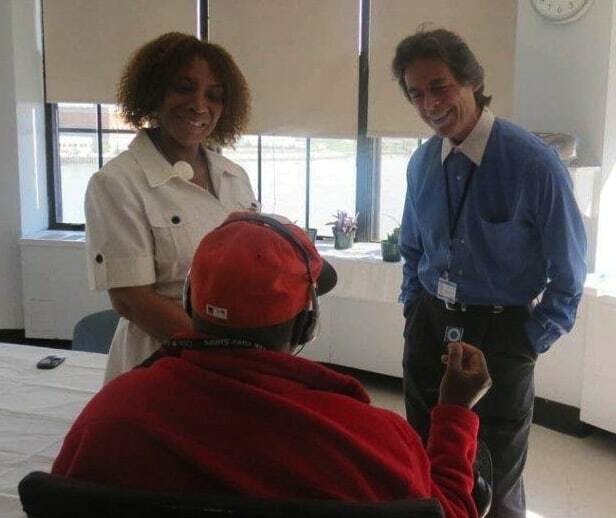 Adopting the MUSIC & MEMORY® personalized music program for dementia residents in late 2011, Coler-Carter currently has 69 of their 425 dementia residents using iPods at the Coler campus on Roosevelt Island. Family and staff play an integral role in selecting appropriate music, notes Rivers. All work together to identify songs that will reflect a resident’s cultural background, language, favorite genre and artists—increasing the odds of tapping good memories. The MUSIC & MEMORY® program has played an important role in the facility’s ongoing efforts to improve quality of life for residents, as well as to reduce use of antipsychotics. Behavioral and psychological symptoms of dementia can include restlessness, aggression, delusions and anxiety, commonly treated with antipsychotics in nursing homes, despite significant side effects. In March 2012, the federal Centers for Medicare and Medicaid Services announced a national initiative to reduce unnecessary use of antipsychotics among nursing home residents by 15 percent. The facility’s multi-intervention approach included staff training focused on how to manage resident behaviors, when to use antipsychotics, when not to use them and when to eliminate them entirely. Dr. Amin says MUSIC & MEMORY® was woven into that process as another intervention. Between January 2011 and June 2013, use of antipsychotic drugs among the facility’s dementia residents dropped from 38 percent to 13 percent, well below the national and New York State averages of 23 percent and 20.5 percent, respectively. That accomplishment earned the facility a Grand Prize at the New York City Health and Hospitals Corporation’s Patient Safety Expo 2013. A year after the personalized music program had been in place, nurses were surveyed to assess its effectiveness. “Nursing perceptions are key to assessing how the residents are doing,” says Dr. Amin. Asked if the residents had shown any behavior improvements while listening to their iPods, the nurse respondents reported that about 30 percent showed a lot of improvement, 40 to 45 percent showed some improvement, and the rest showed no change. Not only has the MUSIC & MEMORY® program improved quality of life for residents with dementia and contributed to a reduction in use of antipsychotics, but also it has made a huge difference in staff morale. Dr. Amin adds that staff morale also gets a boost when caregivers feel they are being heard by leadership and that their concerns and daily challenges on the floors are validated. “To the extent that personalized music reduces difficult behaviors, when staff perceive those behavior problems have been reduced, it helps them, as well,” he says. Measurable success with MUSIC & MEMORY® is prompting facility leadership to explore other uses of iPods. Rivers says they are considering expanding the program to help patients with traumatic brain injuries, as well as patients on ventilators, a specialty at the new Henry J. Carter hospital in Harlem.